Did you know that all the lights in Phipps Conservatory’s Winter Light Garden are energy-efficient LEDs? Did you also know that all of Phipps’ electricity is renewable, with some of it produced onsite? We are proud to work with Phipps Conservatory on one of Pittsburgh’s greatest holiday traditions— the Winter Light Garden. Each year, it is our task here at Hanlon Electric to design a robust, sustainable power management plan and install many of the structures. Leading up to the show, Phipps met with our journeymen during installation to review designs and assess installation progress. Only through collaborations with artists, fabricators and electricians was the vision for Winter Light Garden actually achieved. Phipps strives each year* to make their Winter Light Garden even bigger and better than ever, so this year, guests can enjoy some new surprises: Holiday Hologram glasses will make the light show even more dazzling, an ice tower display will mesmerize guests of all ages and color-changing architectural lighting in the newly-renovated Palm Court are just a few of the new additions to the festive show. *See our 2017 post in the “Expert Tips’ section, for more including Winter Light Garden being named one of the world’s best design + art projects. Visit Phipps Conservatory’s website to learn more or to buy your tickets today. 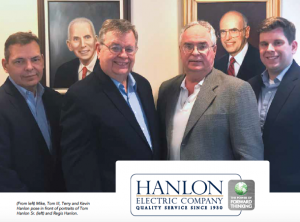 Winter Light Garden open evenings 5 – 11 P.M.
Hanlon Electric Company was featured in the January/Februray 2017 edition of “Breaking Ground” for its streamlined process systems, its new pre-fabrication shop and a very long history of excellence. In 1930, Thomas P. Hanlon Sr. Tom was partners in an appliance store in Squirrel Hill and managed the installation of appliances, including electric installation. He decided to leave the appliance company to start Hanlon Electric Company because the Great Depression hit and business was slowing down. 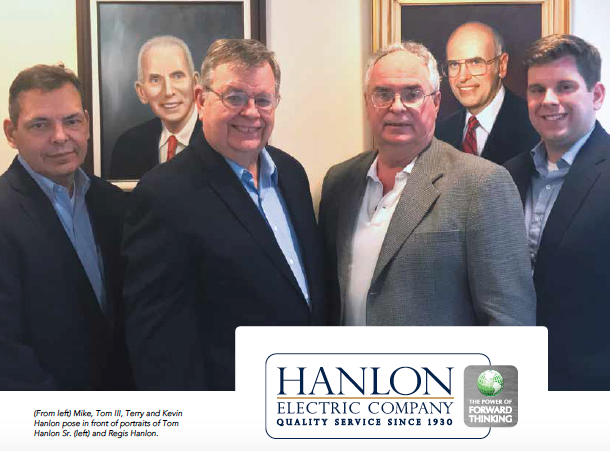 Hanlon Electric thrived under his leadership, and the company remains in the family today under the leadership of Mike Hanlon and his two brothers, Tom III and Terry. Today, hospitals make up 25% of our jobs, and another 20% are in the office buildings downtown. Colleges, museums and service work fill in the balance. Hanlon Electric hired an outside consultant to develop a set of project management protocols. Over the course of three years, they developed a system to help move a project from the estimate phase through construction completion. It helps us to be as organized and efficient as possible, and our clients appreciate the attention to detail. We built a pre-fab shop last summer. Now 30% of our jobs include some type of pre-fabrication, because it helps to increase efficiency in the field. “Our goal is, by the end of 2017, to be doing prefabrication on all of our jobs in some fashion,” says Mike Hanlon. Part of the view at Winter Light Garden. 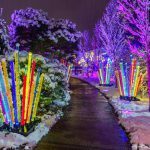 Featured in CODAmagazine, which showcases the worlds best design + art projects is Phipps Conservatory and Botanical Garden’s Winter Light Garden. 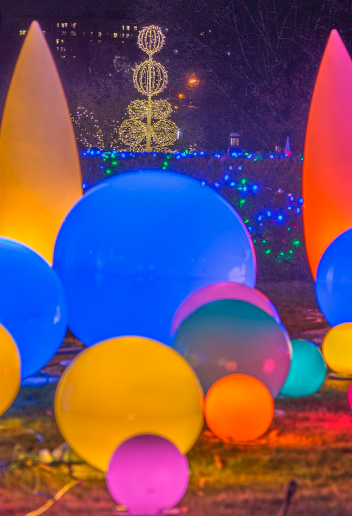 The project, which runs November-February, is exclusively outdoors, and treats 70,000 garden visitors to 1.5 acres of the campus that sparkle with luminous orbs, trees and fountains of light. The Phipps team worked with electrical contractor, Hanlon Electric to design a robust power management plan and install many of the structures. Phipps and journeymen from the electrical contractor met on a weekly basis during installation to review designs and assess installation progress. Only through collaborations with artists, fabricators, and electricians was the vision for Winter Light Garden actually achieved. See the write-up in CODAmagazine. According to PostGazette.com on July 10, 2013, an “eGallon” now costs an average of $1.14 across the U.S., compared to $3.57 national average for one gallon of regular unleaded gasoline. Looks like there are 81 EV charge stations in the Pittsburgh Metro compared with 592 gas stations and Pennsylvanians want more. Hanlon Electric Company, electrical contractor for one of the world’s first certified “Living” buildings, is adding a fitting finishing touch to Phipps Conservatory’s Center for Sustainable Landscapes, as Hanlon installs an electric vehicle charging station (EVCS) on the site. The Center for Sustainable Landscapes is one of the first finished projects to have accepted the Living Building Challenge (ILBI Living Building Challenge certification)—a rating that goes far beyond normal LEED requirements. Among other requirements, Living Buildings must have net-zero energy and water usage. Hanlon is very proud to have been named contractor for Phipps Conservatory’s new Center for Sustainable Landscapes. But the third party credibility of having Hanlon’s work written about by Contractor Magazine further validates the uniqueness of the future-friendly electrical efficiencies we built into Phipps Conservatory’s beyond LEED Platinum new showpiece. Contractor Magazine has over 49,000 subscribers. Data cabling has grown to include multiple options for data transmission over the past two decades. What started with copper-wire phone lines has extended to satellite internet service, coaxial cables, and fiber-optic cables. Coaxial and fiber-optic cables provide the biggest and most lucrative opportunities for internet service providers as well as telecommunications companies. Now that Google has announced its ultra-high speed internet project dealing with fiber-optic cables, the demand for and the drive to provide faster and more efficient service has grown astronomically. Because of these developments in technology it is important to understand the finer points of the different data cabling options. Coaxial cable, most often known as simply ‘cable’ service (as opposed to dial-up or satellite service) is double-insulated copper wire cable used for internet and television transmission. A coaxial cable has a plastic sheath covering the entire length of the cable; a woven copper shield immediately below the plastic sheath; a plastic insulator below the sheath; and finally the actual copper wire itself below the insulator. This type of design allows data transmission in the form of a special electrical current that carries radio frequencies. There are disadvantages to this type of data transmission; for instance, the cable cannot be bent or even significantly curved without ruining the connection to the ISP provider, since the signal would then start reflecting back to the source.